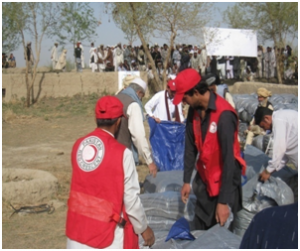 PRC FATA Chapter has the capacity to respond to a number of emergency and disaster situations through a network of its agency level branches and a pool of trained volunteers across the FATA. In a wake of major disasters notably Internally Displaced Persons (IDPs) 2009, Super Floods 2010, Temporary Displaced Persons (TDPs) of North Waziristan Agency 2014 and Earth Quake of 2015, PRC’s effective response to the above has been duly acknowledged by the affected people, Government officials, local opinion leaders and independent observers. In all its operations, PRC gives equal importance to the protection, relief and wellbeing of the extreme vulnerable communities so as to reduce the adverse effects of disasters for them across FATA. PRC has a considerable presence in Bajaur, Mohmand, Kurram and South Waziristan which are the most vulnerable agencies of FATA whereas it has a pool of committed registered volunteers (6000) who are actively involved in providing a range of humanitarian and relief services to the most vulnerable communities. PRC is actively running the below core components (projects) in FATA. Disaster Preparedness (Capacity Building of staff, volunteers and community by formation of community disaster response teams CDRT, PRC has a pool of trained HR at regional level, National, provincial and at district level. Distribution of food packages among 62 families (IDPs of Malakand Agency & FR Bannu) in district Bannu in June-July 2009. 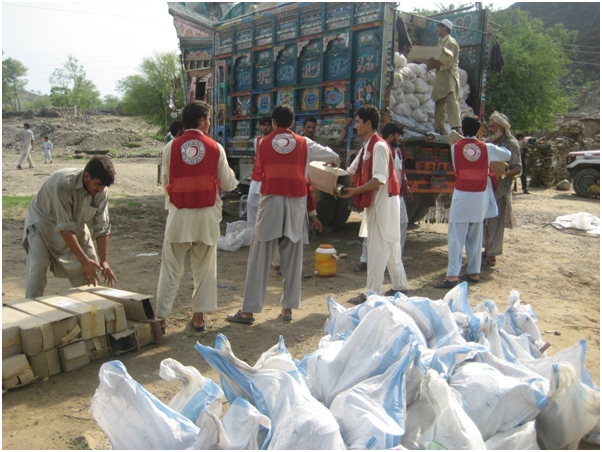 PRC FATA distributed Food & Non Food Items among 7349 flood affected families in FATA during Super floods 2010. PRC FATA Branch distributed Non Food Items (NFI) among 720 displaced affected families due to Sectarian clashes in Kurram Agency in 2011. PRC FATA distributed 1000 Non Food items (NFIs) among returning families of South Wazirstan Agency in DIKhan on 21-22 October 2011. 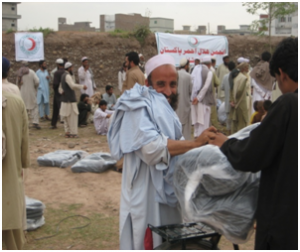 PRC FATA distributed 20,800 blankets among affected families of Khyber, Mohmand and South Waziristan Agencies in 2012. PRC FATA distributed Non Food Items (NFI) among the four thousand (4000) temporarily displaced persons of North Waziristan in Bannu June-July 2014. In 2014 PRC National Headquarters signed MOU with World Food Programme and PRC FATA established two food distribution hubs in Bannu for TDPs of North Waziristan Agency. PRC FATA further extended General Food Distribution project to Bara for the returnees and successfully completed six food distribution hubs in Bara. In 2015 PRC FATA distributed non food items among EQ 900 affected families in Mohmand and Bajaur Agencies. PRC FATA has not only provided medical services in static unit in BHU Torkham since its establishment but also offered mobile health services for the TDPs of NWA in District Bannu in 2014. Initially BHU Torkham was working under the management of PRC-KP from 2002-2007. In 2007 the handling and control of that BHU was taken up by PRC-FATA. An average of 1000-1200 hundred patients from inside and across the border received free medical (preventive and curative) services. In 2014, PRC-FATA provided free medical services on emergency basis to the TDPs of NWA and total of 7000(approx)patients treated in the period of one month. To locate and reunite family members separated by conflicts or disasters etc. Frequently restoring family links across FATA. This is an immediate help provided to a sick or injured person until professional help arrives. The first aid services are planned services provided during public events to respond to potential emergencies. It is established by an agreement between the event organizers, communities and the volunteers and staff in their Red Cross and Red Crescent Societies. Recruit Volunteers, build their capacities and prepare them to effectively respond to the disasters. Only Basic FA trainings are in the process and only 135 are conducted so for. Volunteerism – backbone of the Pakistan Red Crescent. To raise awareness amongst general masses about volunteer work. PRC has a wider support from volunteers in emergency services. Recruitment, training, development and retaining with gender balanced delivery of voluntary services. Deployment of volunteers is key element in emergency response. To introduce good governance and implement the principles of good governance at all levels. To develop PRC youth and volunteer networks at all levels. Maintaining liaison with other voluntary organizations. Develop and strengthen partnership and advocacy at all levels. Formation of PRC Junior/Youth Clubs at schools, colleges and universities level. Monitoring and evaluation of their contribution. Awareness raising and inspire behavioral changes through information sharing, education, training and close coordination with the targeted communities to reduce the risks of injuries because of unexploded ordnances and IEDs, etc. Now this project work in three Agencies of FATA Mohmand Agency, Bajaur Agency, and Khyber Agency. We have four educators and one Agency Officer at each Agency in cited three Agencies of FATA. Till now we have delivered 13775 sessions to 230515 residents of FATA to adopt safety behavior from risky. Inspite of that 103252 dissemination materials have distributed among at risk residents and assist 174 disables in term of artificial limbs of FATA. PRCFATA in partnership with the WFP is engaged in distributing food items amongst the TDPs of North Waziristan Agency and assisting the repatriated families of tehsil BARA of Khyber Agency.